I’m very fortunate to be related to a published author. Granted, it’s by marriage to my dad’s cousin, but I’m still claiming him. His name is Tom Mooradian and his book is called The Repatriate: Love, Basketball, and the KGB. In short, his book is a memoir of the 13 years Tom spent trapped behind the Iron Curtain in Soviet Armenia after he and 150 others repatriated to the country in 1947. It’s a wonderful story that reads as a fiction novel, but I guarantee you that every word of it is true, or as close to true as memory can serve after 50 years. Tom and his wife invited us to come visit them for a weekend after attending our wedding and I was ecstatic. The house they live in is on a beautiful like in Northern Michigan. My dad’s been visiting it his whole life and I remember many summers swimming in the rocky lake. When Tom’s mother-in-law passed away, Tom and his wife were the natural heirs. More than enjoying the fall colors, I wanted to see the ‘glamors’ of the life of a writer with a beautiful setting to write in, retired without another job to distract him. I was curious how he had done what he did. Tom published his book independently and has sold almost 2000 copies. He has toured the US with speaking engagements and if you meet an Armenian in Michigan, they probably know or have heard of Tom. You may be asking yourself “How was it?” Well, I’ll tell you it was much like any other time visiting relatives. We had tomato soup for lunch, went for a walk, made cake, played board games, watched the MSU v. Purdue game, and went to church. But the conversations in between is what you’ll really be interested in. 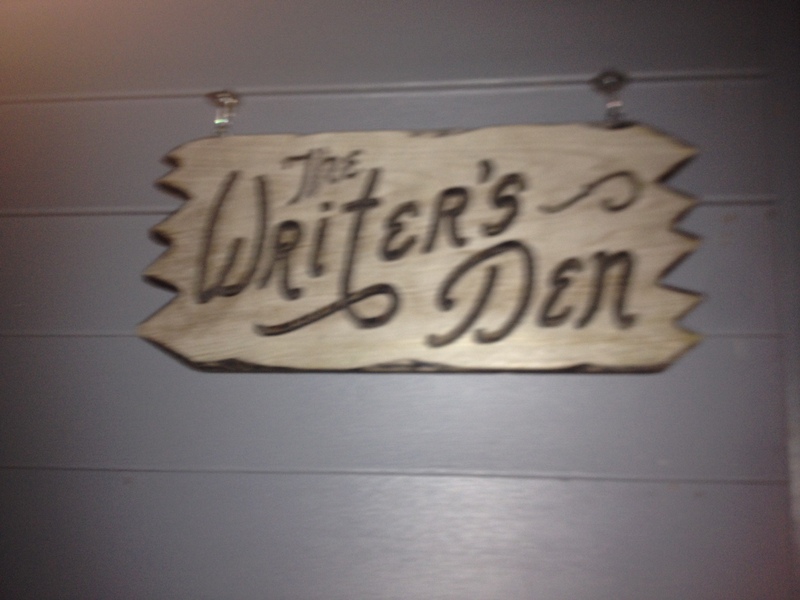 And more importantly, when I saw his writer’s den. As mentioned, Tom self-published his book. He also self-edited a lot of it with the help of his wife. She went through the manuscript and edited it down before the two of them went through it together, getting into arguments about words and other such minutiae. After the book was released, Tom spent almost half of a year traveling around the United States to give talks about Armenia and the repatriation. Currently he’s working on the sequel after a trip with his wife in daughter to his old home in Europe. Between the heartbreaking Tiger’s loss and the UofM win over Indiana (I’m sorry if you don’t care about Michigan sports) I convinced Tom to let me see his writer’s den. I wanted to see where he would sit to be inspired. I have to say it’s not what I expected. But at the same time, it was. The sign outside Tom’s work space. Tom’s den was formerly the unattached garage, which I’m pretty sure is now half storage. His half has a wall full of books; all kinds of books. There were his reference books on the Soviet Union, Armenia, and the Cold War. There were books I’v read and loved including Sara Gruen and Laura Hillenbrand. There was a cot in the corner where spare grandchildren sleep when the masses come to visit. And there was his desk, lined with reference books and reading books, covered in papers and pens all framing his desktop computer. The white desk is nothing special, but it’s all he needs. I was surprised to see only one window looking into the greenery and plain walls. Unlike me, Tom must need minimal distractions to focus. The beautiful red of a Michigan autumn do not inspire chilling tales of Soviet oppression. Despite the lack of nature inspiration, Tom’s room is exactly as he needs it to be. Tom has been writing his entire life; first as a journalist and now as an author. He knows what inspires him and where he needs to be to focus. So, Reader, I will end this with a question to you; Where do you need to be to write? What inspires you? Please leave a comment and let me know, I’m still trying out some different things. I recently read ‘Repatriate”. It was a great read and the personel connection warmed my heart. I too am graduate of Southwestern High and lived most of my life in Delray. i meet periodiodically with some of Tom Mooradian’s classmates….Willie Haboly, George Jacubic, and Betty Peters.. We talked about Tom’s book and his ordeal this morning. It would be nice to meet him in person. I too am a writer, as is my son. Check us out at http://www.rjhaig.com I presently live near Mackinaw City. Let me know if a meeting is possible and tell Tom I enjoyed his book.